Differential Brands Group Inc (NASDAQ: DFBG) stock soared higher by more than 100 percent early Thursday morning in reaction to an M&A announcement. The portfolio of global consumer brands said in an 8-k filing it has agreed to acquire a large portion of Global Brands Group's North American business for $1.38 billion. SPDR S&P 500 ETF Trust (NYSE: SPY) could see increased volatility amid two notable potential market moving events: The government released its initial jobs claims report, which came in at 231,000 versus the 250,000 expected; At 2 p.m. EDT, the Federal Reserve will release minutes from its June meeting. 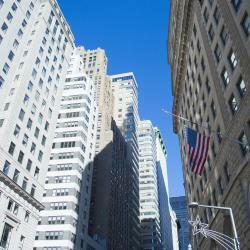 New Concept Energy, Inc. (NYSE: GBR) was trading higher by more than 20 percent. The nano-cap low float stock skyrocketed from below $2 per share in late June and peaked at $13.80 on Tuesday before falling 70 percent and closing at $4.11. There is no news or clear catalyst to support these large moves. Praxair, Inc. (NYSE: PX) was trading flat after the industrial gas giant reached an agreement to sell the majority of its European assets to Taiyo Nippon Sanso Corporation for 5 billion euros in cash. Gold Standard Ventures Corp (NYSE: GSV) gained more than 7 percent after Goldcorp Inc. (NYSE: GG) said it increased its ownership stake in the Canada-based advanced stage gold exploration company from 9.9 percent to 12.7 percent.